The head of the Pontifical Academy for Life said yesterday that religions should be the guardians of palliative care. Source: Crux. “Palliative care represents a human right and several international programs are working to make it so,” Italian Archbishop Vincenzo Paglia, President of the Pontifical Academy for Life, told Catholic and Muslim experts on healthcare and ethics at a conference in Doha, the capital of Qatar, yesterday. 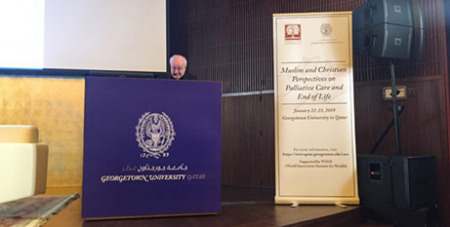 Concluding today, the two-day “Muslim and Christian Perspectives in Palliative Care and End of Life” conference is taking place in Doha, Qatar, and is organised by Georgetown University in collaboration with the Academy for Life and the Wish Program at the Qatar Foundation. The World Innovation Summit for Health (WISH), a global organisation based in Qatar aimed at providing healthcare, and the Pontifical Academy for Life signed a Joint Declaration on End of Life and Palliative Care yesterday promoting an integral approach to the human person. The event is part of the many initiatives that the Academy has launched to promote palliative care around the world.